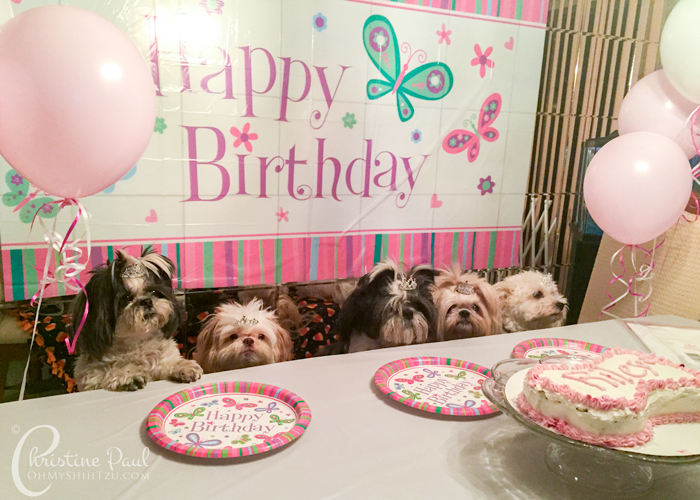 So Saturday was a joyous day at our house due to one little Shih Tzu’s Birthday party. Yes Riley turned 4 years old. Having 4 Shih Tzus can put a little dent in the wallet sometimes, so I really wanted to be able to throw Riley a little party but stay within a budget of less than $20 for the party, which was to cover all the decorations. Now remember, even though this is my idea of a Shih Tzu birthday party, it can be used for any cute little doggie! Which means YOUR cute little doggie too! All the Girls wait for a bite of Cake. The majority of the decorations were purchased at Dollar Tree, which I find to be the perfect store for many disposable items. Originally I thought of throwing a Princess Party, but when I found the butterfly theme I just couldn’t pass it up. The one thing I did not add into this total was the disposable helium tank I purchased. The helium tank was $30 but I will probably be able to use it a total of 4 times if I blow up the balloons to approximately 9 inches, according to the information on the box. So I would call this a success in keeping this within budget. I still have plenty of balloons left over, a few plates, some balloon string and all the tiaras! The girls absolutely loved this party, I really think they knew what was going on. Once I placed them on the “bench” seat, really it was a board with a Halloween themed fleece thrown over it, they stayed there in anticipation. I thought I would share the festivities with you for the birthday girls song. Please excuse my hubby and I singing :). If you are wondering, how about the cake? Initially I was going to order a special b-day cake, but the cakes I found were all between $40-$50. There was no way I was spending that kind of money on a cake. So I set out to make my own! After searching a number of recipes I customized my own recipe to my dogs tastes. I really wanted to keep it inline with their normal raw diet as not to upset their tummy’s so much. A Yummy DIY Doggie Birthday Cake. Doesn’t that look yummy? 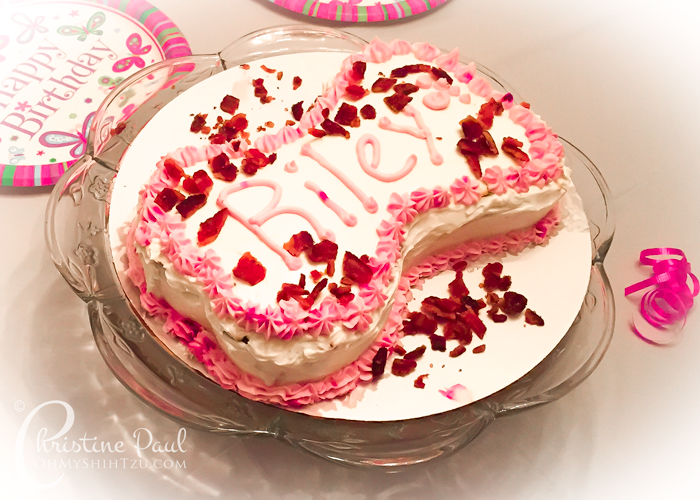 If you want the recipe, and to see how I made it, check out our post DIY Dog Birthday Cake as we join the Tasty Tuesday blog hop! « Shih Tzu Birthday Girl Riley! That first photo OMD cuteness overload. This is so creative and so clever – ty for sharing. And of course – happy birthday! The picture of them all at the table has to be one of the cutest pictures I have ever seen! Looks like a lovely party and what a beautiful cake. I will make sure to tune in tomorrow for the recipe. Aww, they look so adorable all lined up like that, waiting for the cake. I love the dog bone shaped cake too. That’s so cute. Thanks for sharing Riley’s birthday party with us! Good job. Jeanne Melanson recently posted…How Do Dogs Get Canine Distemper? Is There a Cure? Beautiful cake. One year I did ice cream cones filled with canned dog food and topped with a dog biscuit. It was easy for the dogs to eat. Now this is cute! Look at those well behaved pups! I had a birthday party last year and some of the doggies were a little excited! My human made a big to-do about everything but I think my fur-iends really just liked the games and cake. You are awesome for making your own cake too. Thanks for visiting my blog earlier too! That is adorable!!! Everything! Love the decorations and especially the cake. That video was super cute too. HAPPY BIRTHDAY, RILEY!!! Kitty Cat Chronicles recently posted…20 Paws Up for The Honest Kitchen Smittens Cat Treats! Can’t wait for your recipe on tomorrow’s Tasty Tuesday!! That photo is so cute. That was awesome. I loved the pic of all them lining up waiting for their cake. HAPPY 4th BIRTHDAY RILEY!!! I’m a couple days late but I hope everyone enjoyed it! You did a great job on everything and great budgeting too! I think your cake is Gorgeous! Bet it was yummy! Ele’s 4th birthday was on Sunday, January 18th. Thanks for sharing this party post – now I’ll be prepared for next year! Happy Birthday to Riley who will be perpetually one day older than Ele!